The Wing Clipper is a must have tool if you are making Flying Geese units for your quilt. This tool, and the associated Fast Flying Geese construction technique, allow you to make four finished units from five squares. The best part is that each unit is constructed slightly oversized so each can be trimmed to a perfect size with perfect seam placement once the sewing and pressing are complete by using the Wing Clipper tool. You can see the tool in action on our free online video demonstration below. Every single unit will be exactly right every time. Now who ever thought that would happen with Flying Geese units? Wait until you make flying geese with this ruler...nothing else will do! This shaves time off making flying geese, PLUS they are accurate! What could be better? What is a Wing Clipper Ruler? 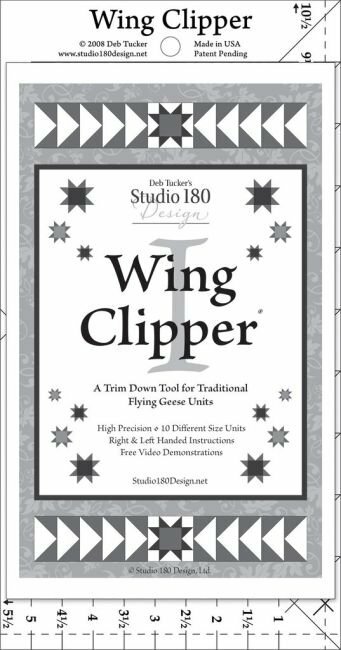 How to use the Wing Clipper Ruler for Making Perfect Fast Flying Geese!